DO YOU NEED A PHONE CALL WITH HEAVEN? Please email to inquire about upcoming availability for a phone reading. A phone reading can be just as detailed and accurate as an in-person reading. However, as a former therapist, Heather prefers face to face meetings for readings because of the sometimes highly sensitive content and her belief that in a world of ever-increasing technological advances, we need real human interaction more than ever. However, due to the large volume of requests, Heather does set aside some time in her schedule each month to provide phone readings. All pricing is for a phone reading with one person only. It is best that you be alone or able to isolate yourself from others before proceeding with a phone reading. Having others with you during the reading will bring additional information and spirit activity through to Heather, so it is imperative that if you desire to have others with you for your phone reading that you make arrangements for such a reading ahead of time. This reading length typically offers contact with one or perhaps two spirit people, or “check-ins” (brief validations) from many spirits. This session tends to move very quickly and may not allow for many questions. 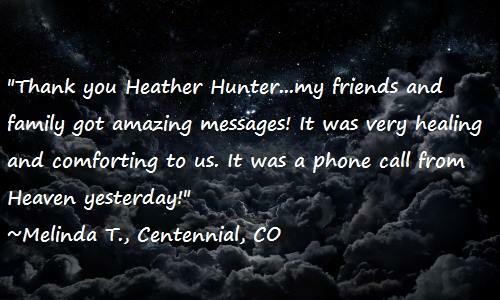 Heather’s goal in this time-frame is to give you evidence of the ongoing presence of one or more passed loved ones. They may make mention of your current life and situations. Recording your session AND note-taking is HIGHLY RECOMMENDED. (Heather does not provide phone session recording). 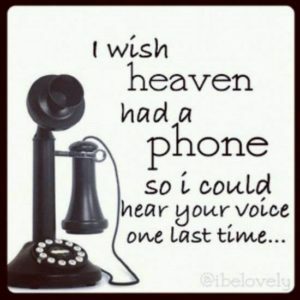 A one hour mediumship phone session consists of one to several spirits connecting with evidence of their identities (through various means). Typically (although not guaranteed) one spirit will offer a considerable amount of evidence, memories, mentions of your life, and more. There is also time to ask several questions to your spirit people or person and Heather, and address concerns you have regarding your loved ones, the Afterlife, and more. You are encouraged to write down a few questions regarding thoughts or concerns about your loved one. Sometimes your spirit person will address those concerns before you ask! (Please note, questions for your loved ones would not be further evidence-seeking or “test the medium” things such things as, “What was that nickname you always called me?” Rather, they would be thoughts, worries or concerns on your mind about them, something that occurred while they were living, or possibly a family situation). Recording your session AND note-taking is HIGHLY RECOMMENDED. (Heather does not provide phone session recording). This option is available to those who would like to ask Heather one specific question regarding a current life situation or one living individual. Heather will receive her insight/information from your guides as well as her own (although source of information is not discussed as part of the reading). Things such as career/job choices, moving, travel, concerns over living family members/situations and friendships/co-workers/ romantic relationships are typical. Heather does not advise on legal or financial decisions nor ongoing or upcoming court cases. While Heather may get some general health insight, we do not advise selecting this option to ask a serious health question or to get direction about major health decisions. When requesting this option, please state in your email the one life question you wish to address. Due to demand for private sessions and the limited availability, session payment is non-refundable but may be applied to a rescheduled date if necessary. Appointment may also be gifted to someone else, but please notify Heather. If the appointment is cancelled on our end, a refund will be provided. You agree to read and follow to the best of your ability, the guidelines provided when booking your session. Heather cannot control nor guarantee who or what will come through. A session with Heather is not intended as a substitute for licensed/qualified legal, financial, psychological, or medical care and/or guidance. Heather is not responsible for any decisions or actions taken as a direct or indirect result of a phone session, or attending any in-person session or event with her. There are no refunds on completed readings.